Ultra compact portable PA system with Bluetooth MP3 player. Whats the point of a speaker system if it doesn't deliver quality sound? The ES-210MXBLU is filled with innovative technology that screams euphoria. 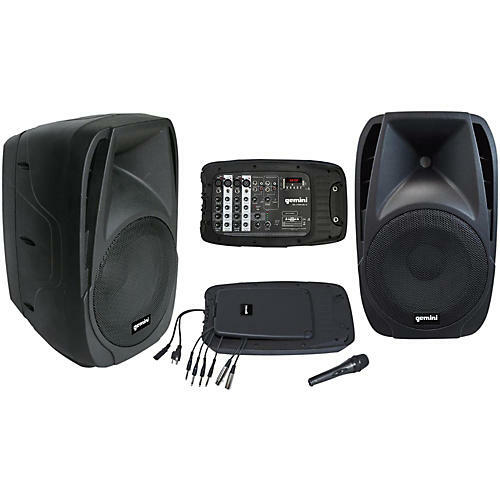 It has two 10" passive speakers with a 600W peak, 150W RMS Class D built in amplifier for heavy-duty support. And if that wasn't enough, you also get 10 LF woofers with 2 voice coil. The ES-210MXBLU Portable PA System is designed to give you a true taste of fantastic sound without the unnecessary bulk. With an extremely durable ABS impact resistant nylon fiber cabinet, this magic box weighs only 44 lb. The ultra-lightweight speaker system also comes with ergonomic top and side handles so you can easily carry it wherever you need to. You don't just get a box; you also get one microphone, 15V of juicy phantom power for capacitance microphones and all the cables you need to make this beast sound out loud. Complete PA package, goes just about anywhere!